Free sniper games celebrate the deadly long-shot marksmen, and they can also be a whole lot of fun. The games listed below are some of the most solid free sniper games in the genre. Pass the hours away encapsulated in games of intelligent thought. Unlike the standard first-person shooter games, sniper games normally require more thinking strategy, and you engage in a more interactive environment to shoot out levers, lights and sometimes even car tires to accomplish objectives. Here are our picks for the best sniper games for free use today. One of the free sniper games to adopt a more lighthearted attitude, Panda Tactical Sniper 2 has a flavor never before seen in the genre. You play the role of a hired gun who must help a criminal panda break his bear buddies out of prison and steal a diamond. The pressure mounts at the final heist of a diamond guarded by lasers. Panda Tactical Sniper 2 hides a hilarious rubber ducky in every level. When you start basic training, you might think you have to defend the panda from this assassin rubber ducky spying on the panda from behind a tree. You’ll fail the first level if you do not look for the targets above the wall. In truth, the rubber ducky serves no purpose other than to shoot for giggles. The environments of Panda Tactical Sniper 2 are highly interactive and serve a monstrous role in completing the levels. If you shoot the guards, the game starts the level over again with a self-righteous panda chastising you for killing a guard. Arma 3 is a war simulator of stunning realism. The story is placed in 2030 on the islands of Altis and Stratis in the Mediterranean. Expect sea, air, and ground combat in this free sniper game. Players employ a variety of weapons, vehicles, and other military equipment as they use reality-inspired tactics to win the battle. There are two modes available: singleplayer and multiplayer. As a single player, you will assume the role of soldier Ben Kerry, who gets caught in a flashpoint in the Mediterranean. Immerse yourself in the gameplay across three episodes: Survive, Adapt, and Win. In the multiplayer mode, you can form a squad and fight against your enemy in the Defend and Seize scenarios. Additionally, there are many other unofficial game modes developed by the game’s community. There’s also the Arma 3 Zeus form of multiplayer, where Game Masters can manipulate scenarios and create surprising challenges for other players. A complete opposite from Panda Tactical Sniper 2, the game designers of Sniper Freedom slanted the gameplay more towards the gamer who wants to relax while playing. It’s not difficult. Like with Panda Tactical Sniper 2, the highly-interactive environment takes a central role in completing the levels. Throughout the game, you play as a hired sniper who must shoot fire extinguishers, levers, dog leashes and other environment objects to drum up a diversion to help your client escape. Some of the levels only have you shoot one thing, and you will progress to the next level. Cleanse over 13 marvelous cities from cold-hearted terrorists as you shoot your way through the levels. 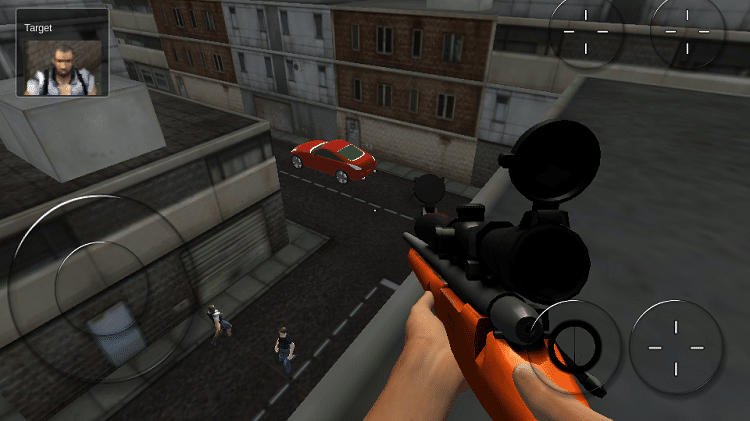 Sniper 3D Assassin delights the eyes with thrilling graphics and cool animations. You can choose from an arsenal of weapons like snipers and regular rifles. The game designers have not finished with uploading new content, so if you stay tuned, you will find the game has new levels added every once in a while. Moreover, the game often leaves you laughing at the hilarious mission descriptions. As one of the free sniper games, you sometimes worry the game designers will create a pay-to-win structure. However, while Sniper 3D Assassin has in-app purchases, you can pass the levels even without purchasing anything. Along with the main missions, Sniper 3D Assassin also lets you play through the side missions to play for longer. Download link for Android: Google Play Store. Download link for iOS: iTunes. The mesmerizing plot glues you to the screen as you play with and upgrade more than 20 different weapons and play through 30 missions. This jewel of a game has both challenge and heart. The art style and graphics are simple, but they are endearing, and they do not take away from the gameplay as you progress through the levels. Before each level, you will watch a cutscene in the comic book style. The first two chapters of the game pose no challenge, but as you dive deeper into the game, the levels grow in difficulty, and you find yourself addicted to the story’s cliffhanger twists and striking plot. The game does have a few plot inconsistencies, but as one of the free sniper games, it is hard to be too picky. One of the most iconic free sniper games in the genre, Sniper Assassin 5 comes jam-packed full of hot action and assassinations. Considering the game designers made five different titles, it should not be surprising how successful the series has been. You see life through the eyes of Shawn Davidson, a man who must seek vengeance for the murder of his wife and best friend Ben. When you start, you might experience trouble with level one and zooming, but after that, the game offers a straightforward appeal with a small learning curve. Some of the levels in the game require more thought as you puzzle out how to beat them. For example, on level 3, you have to destroy a power grid through the shooting of a cable. If you have not played the other Sniper Assassin games, you may want to play through them first to avoid spoiling the story. The graphics employ stick figures, so it’s nothing overly impressive, but the gameplay locks you in, and you will have a hard time sleeping or eating. These free sniper shooting games can quickly become addictive and each of them offers something unique. What separates this genre from the FPS genre is how you have to clear the mental noise and think through your actions. Do you have what it takes to become the ultimate assassin? If you thought of a better free sniper game, feel free to leave your comments and share your opinions below.